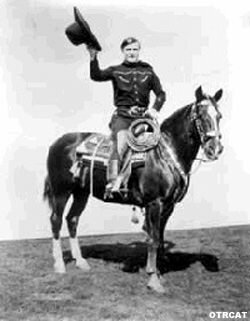 Tom Mix was one of the great American popular cowboys, and he was one who was a real cowboy, too! Despite being born in Pennsylvania in 1880, he became a champion rodeo roper and rodeo hand and then wrangled his cowboy skills onto the silver screen early on, in 1910. He was a big star by the time the early 1930s rolled around, and Ralston Purina Company of "Checkerboard Square" made a radio show for him. 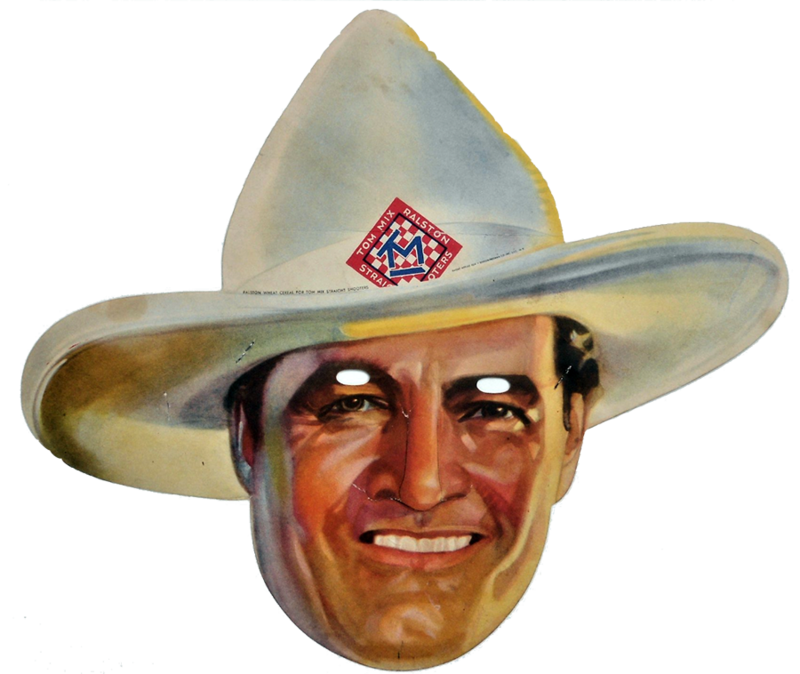 It was planned as a rival, or at least co-rider to the popularity of that other early '30s great kid's show, Jack Armstrong the All American Boy. Tom was the perfect western hero, with his "wonder horse" Tony, and TM-Bar Ranch, where he lived with his young wards, Jane and Jimmy, along with his elderly sidekick and ranch hand, "the Old Wrangler." 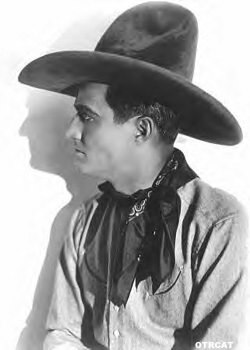 Various actors played the parts through the years, as Tom Mix rode long in the saddle of old time radio. Joe "Curley" Bradley played Tom Mix through most of the later years of the show. A child actor, George Gobel, went on to become "lonesome" George Gobel, a flat-top haircut styled star of black-and white TV. The early shows are thought entirely lost in that great sunset, but there are some examples of the later show to enjoy. It's the usual mix (Tom Mix-style) of western ranch life, bad men, an occasional mysterious ghost or invisible rider. Tom could carry a tune, too, and occasionally sang a number, and even sang on the commercials! During War War II, Tom was on the air with episodes that allowed him to (somehow) battle evil saboteurs and dirty infiltrator she even flew over to Europe to rope some enemy. For more juvenile western adventure, please see Cisco Kid, Roy Rogers, Sky King, and Wild Bill Hickok. 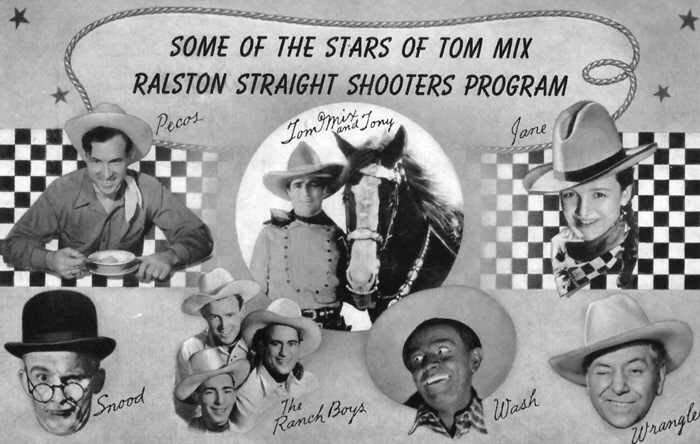 The whole ranch family would like All Star Western Theater, and there are nine episodes of the rare early show, Bobby Benson and B-Bar-B Riders. Plus for a frozen north take on the western scene, you can dog sled with Sgt. Preston of the Yukon. 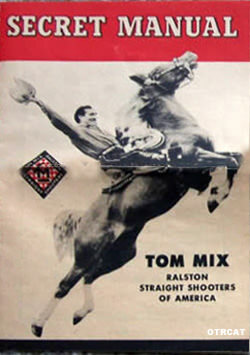 Be the first to comment on "Tom Mix"